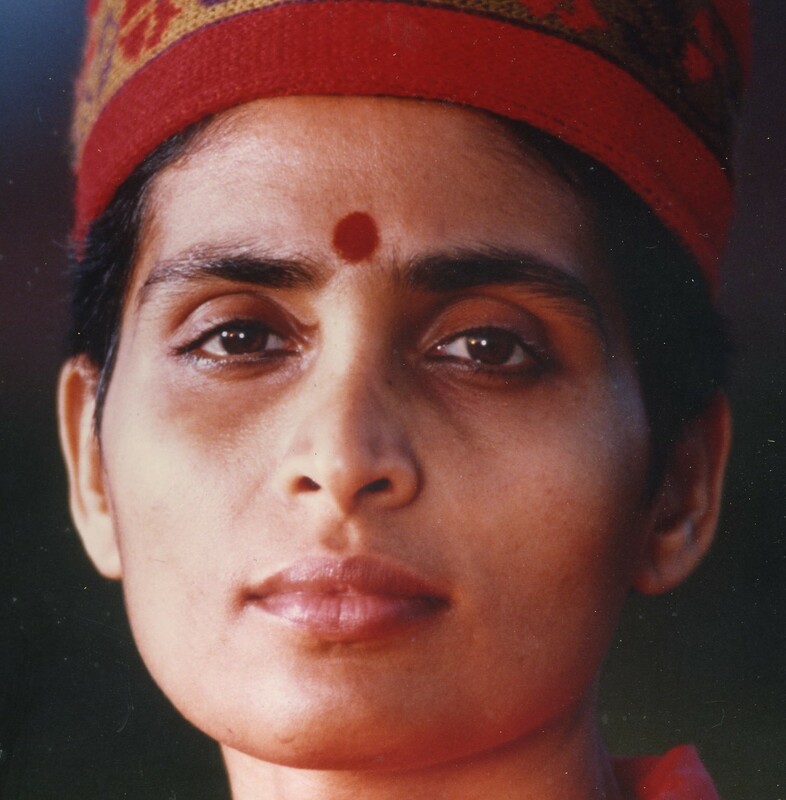 The first time I heard of Bhagawan Nithyananda was on Jan 3rd, 2010 when Mohanji posted his “Growing With the Master” blog post. Until then, the only Nithyananda I heard of was the contemporary Paramahamsa Nithyananda. I thus I asked Mohanji bluntly: “And who is now this Nithyananda?” He told me that Bhagawan Nithyananda was a great Master, a real Avadhoota from Siddha Yoga tradition, who lived in the first half/mid of 20th century. Mohanji said that, speaking of Nithyananda, he simply felt the pull to mention this Master as well due to his amazing stature. 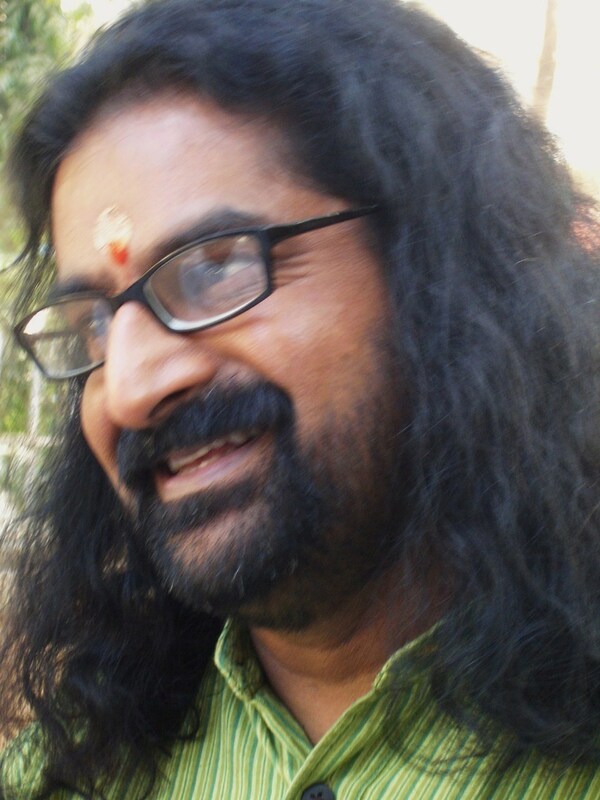 Furthermore, on 25 Jan, Mohanji posted “FAQ – The Loud Silence” in which he again mentioned Bhagawan Nithyananda (also known as Bade Baba, or ‘big Baba’, due to his height). 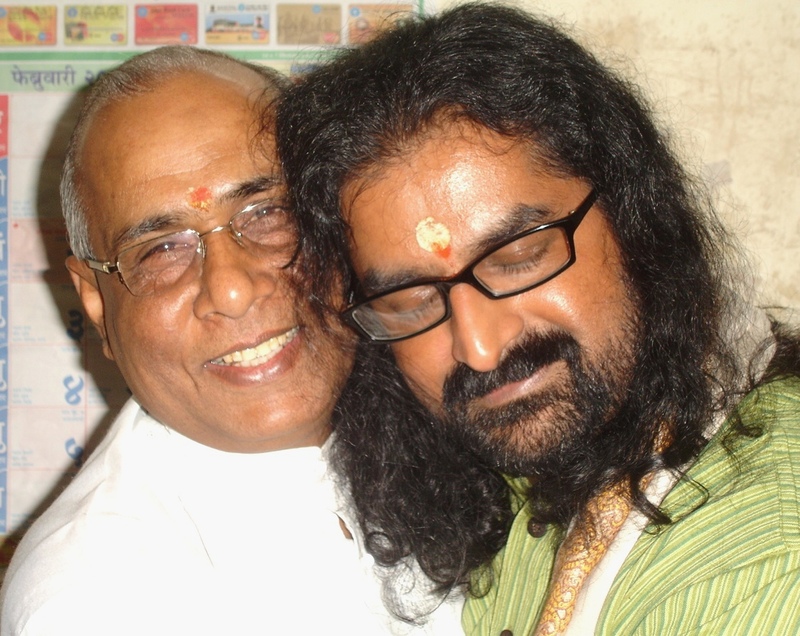 I knew what this meant – Bade Baba’s presence was not leaving Mohanji’s inner space. 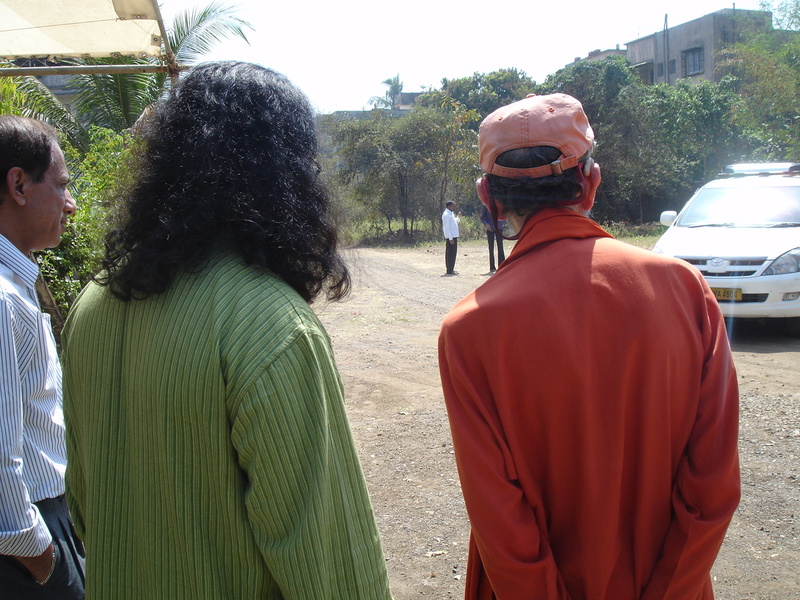 The opportunity to do so opened up very soon – in Feb 2010, since we were able to club this trip to the already planned Shirdi Trip on Mohanji’s birthday, Feb 23rd. I was happy to visit another Shaivic Master’s samadhi shrine, and was open for an adventure without harbouring any expectations. One thing is for sure – I never expected that the experiences at the abode of a Master I never heard of before would reveal to me so much about the true nature of our spiritual path. Indeed, it was like going home. There were several people who were supposed to join us, but, interestingly enough, in the end they all dropped off, except for Dr. Samata. Our merry trio was thus to head off to Ganeshpuri on 18 Feb, very early (3.30am) in order to reach our destination by 5am, as advised by Mr. Palival from Ganeshpuri. We were asked to reach there in time to participate in the morning invocations of Guru Gita at Swami Muktananda’s samadhi (Swami Muktananda was the direct disciple of Bade Baba who carried his legacy across the world). However, the taxi driver that Dr. Samata arranged got lost on the way, i.e. was not able to find our small hotel, and in the end reached almost an hour late! We were definitely not happy about it and prayed that, somehow, we reach on time for the invocation. And that is EXACTLY what had happened – it was a miracle how we managed to reach so fast – as if we flew on the road. Moreover, upon entering the Ganeshpuri campus, we realized there are so many junctions and no signs to guide us which turn to make. The driver did not know the way either. However, guided by intuition and Master’s grace, we arrived straight to Bade Baba’s samadhi and then had to come back to a nearby samadhi of Swami Muktananda where Mr. Palival was waiting for us. Everything flowed with ease, the atmosphere was purely satwic and, to my great joy, we also had sufficient time for a warm cup of chai at the canteen before the Guru Gita chants started at 5.30 am. I must say that, for me, this was an unprecedented experience. The collective chanting and the atmosphere was overwhelming. 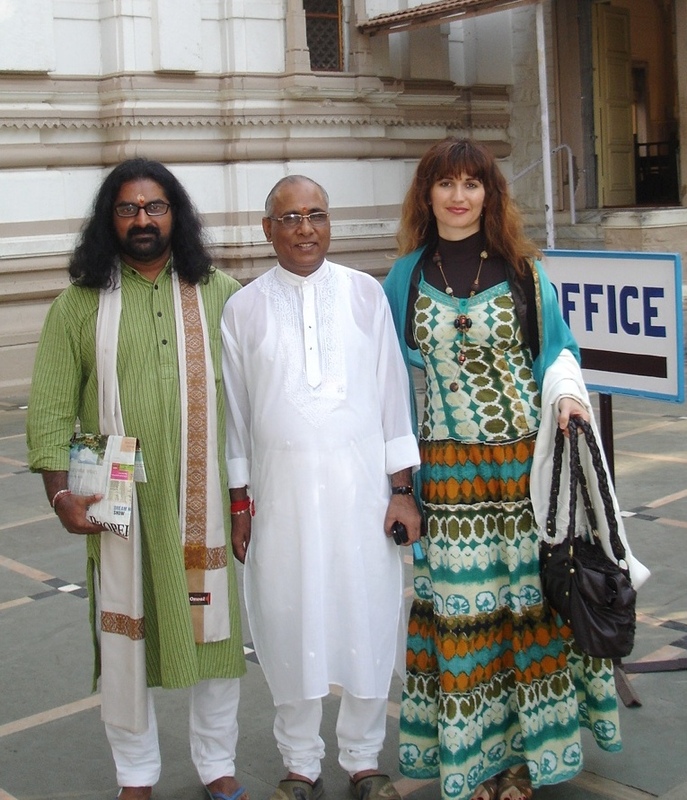 There were two Indian men and one western lady who chanted Guru Gita jointly (since it is like a Q&A between Lord Shiva and Parvati) – their voices were blending so perfectly that it sounded like the music was coming straight from the angelic realms! The female voice was especially divine – I loved it and simply soaked in it. The overall vibration level of the place was just superb – a true abode! Swami Sevananda escorted us to Nithyananda Samadhi. This was indeed amazing and totally unexpected. We felt honored. It became all the more evident to us, that our dear brother Dipak Haksar has conveyed the message of our arrival there in great detail, and the whole Ganeshpuri reciprocated to his love and deep affection. 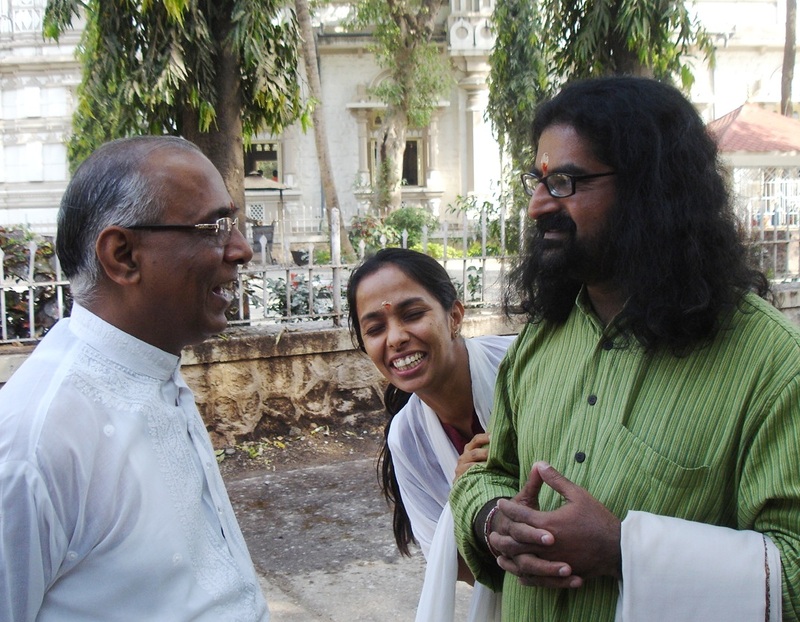 Moreover, since the ‘coincidences’ and sincerity of people greeting us were so intense, it was clear to us that it was Bhagawan Nithyananda who was orchestrating it all. This trip indeed was His invitation without which nothing can actually take place (we were told that this happens to all those who are fortunate to somehow reach Ganeshpuri). We felt His divine presence in each little grass and stone of this divine abode – his energy, showered on us from the supraconscious realms, was so intense and unmistakable. His loving actions were way beyond common politeness. He felt especially connected with Mohanji – loving vibes were bursting out of both. He garlanded Mohanji, gifted him a scarf – he simply did not know in what other way to express his love. I was just observing all this and my heart was expanding with joy. I also noticed that something was happening in my inner space. Several times I felt a distinct tickle on the top of my head and soon understood – it is Bade Baba, blessing us. Oh, what a giant. His presence was felt so clearly – the love that he showered us with made all of us so joyous that we didn’t know what to do with all that love :-). 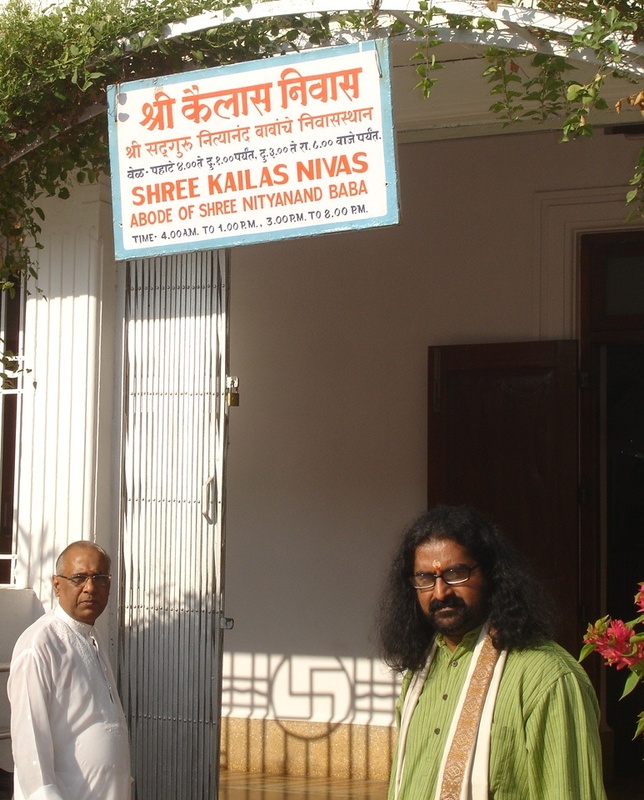 As we entered Kailas Nivas, we again felt overwhelmed – I somehow felt that Bade Baba was above us like a cloud, merging with us, and guiding us to his most intimate places. It was amazing to see his personal items, touch his bed, favorite chair, see his photo images, feel his energy – we were indeed soaking in and breathing Bade Baba. He opened all the rooms which are otherwise not opened, except for cleaning. It is usually not allowed to take photos at these sacred places, but Mr. Rakesh made an exception for us – after all, at one’s home, everything is allowed 🙂 It was indeed a “home coming” for all of us. I was so thrilled and eager to learn more and more about the spiritual giant of Nithyananda – I did not know his stature was that great and was surprized that I never heard of him before. It is a great honor to write a few words about this extraordinary Master, who, as Mohanji said, blessed the Earth by his presence. Just like in case of Shirdi Sai Baba, nobody knows when and to whom he was born as a child – Bade Baba was found by a village lady called Unniamma, who had a dream of Lord Vishnu and Lord Shiva bathing on the banks of a river. That vivid dream woke her up around 3.30amin – she decided to go to her landlord’s house rather early. It was raining and, after the flash of lightning, she saw with her own eyes a child lying on a bund, with a big snake behind it, as if protecting the child. It was Unniamma who brought up this unusual child who was clearly different (e.g. he loved to play pranks, like diving into a lake and disappearing for some time; would expalin difficult philosophical concepts with great clarity and wisdom at a very young age, etc). When he was ten years old, he embarked on a pilgrimage to Kashi, many other holy places and then Himalayas. His wandering (Parivrajaka) lasted for about ten years. He then returned to Kerala for a while, and then went to Indonesia, Malaysia and Burma. Some time later, he returned to South India, where he soon became famous due to many miracles that he performed and various siddhis that he displayed (like materializing things, appearing at several places at the same time, living undergrouond for many days without oxygen, food and water, walking on water as if it is solid (like Jesus Christ), talking to animals and sharing his food plate with dogs and cats (who would, in front of him, blissfully eat together), etc. He never stayed in one place for more than a few days, but, wherever he went, people flocked to see him. 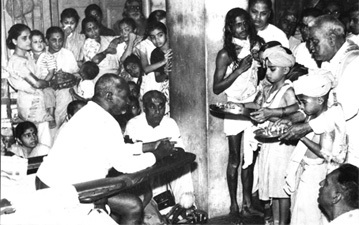 Just like Shirdi Baba, he distributed whatever was given to him before the day was over and never cared for fame. There are many interesting stories from Bade Baba’s life – I’ll share one with you, just to give you a glimpse :-). This was the first booklet (in a cute format of a comic) that I read from all the goodies we bought at the galleria in Ganeshpuri. Unlike Mohanji, it was only then that I understood just how amazing is the stature of Bade Baba – I was so deeply touched and felt so grateful that I got to pay the homage to this extraordinary Satpurusha. His abode, Ganeshpuri, is especially sanctified because of his continuous presence there at the latter stage of his life. I highly recommend to all who visit India to definitely come to this indescribably tranquil and serene abode of a Master, a great Siddha. As soon as you enter the temple you will undoubtedly feel the world slipping away and calmness and serenity descending on you. The blessed p eace of most refined silence is tangible here. No voices are raised and people speak only when necessary. And yet, the place is brimming with joy – one feels expanded from within, deeply enriched. A Master who operated fully from the being level till date transfers that experience to all those who visit Ganeshpuri with a heart full of gratitude. All this was going on in my mind and brewing in my heart as we bathed in the energy of Ganeshpuri. We also attended the noon Aarati after which Mr. Rakesh, Dr. Samata, Mohanji and I shared many laughs, expressing sheer joy. After enjoying a wonderful Satwic lunch, in the company of our dear Swami Sevananda (who again appeared before us to make sure we are fully taken care of), we bought many lovely CDs, books, insense and essential oil fragrances in the Galleria. It was so lovely to be in the company of Swami Sevananda, who shared with us many of his experience with Swami Muktananda and really showered us with love ( knowing that he has so many other responsibilities, we were truly honored by the amount of the time he gifted us). He was with us till the very last moment – in the end,he gave us the packets with prasad, sending us off lovingly. As we were leaving Ganeshpuri, I enjoyed sitting next to Mohanji in the car, observing how happy and deeply fulfilled he was – his entire being was smiling. I must confess that I was not supposed to join Mohanji for this trip, since I started working only a few months ago and already took too many leaves. But it was Shirdi Baba and Bade Baba, I know, who made sure I don’t miss this experience. The very thought of their love and grace brings tears to my eyes instantly……. Thanks for sharing. This blog contains tremoundous amount of energy. Before coming to Dubai, i had joined one personality development class. There i came to know that sister of our teacher was living in Ganeshpuri ashram. When our teacher realized my interest in spirituality, he provided me lots of spiritual magzines published by Ganeshpuri Ashram. Baba Nithyananda was great siddha master. 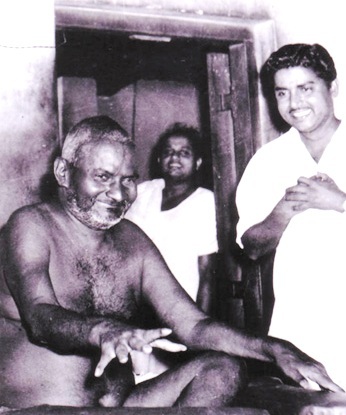 As mentioned in the spiritual magzine of Ganeshpuri ashram, Shri Muktananda was wandering all over the India. At one place, one sadhu told him to go to Ganeshpuri, which is his destination. 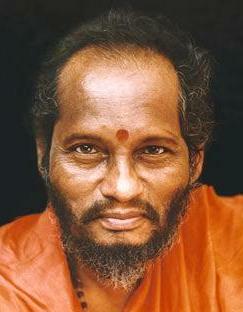 Muktananda became disciple of Nithyananda. 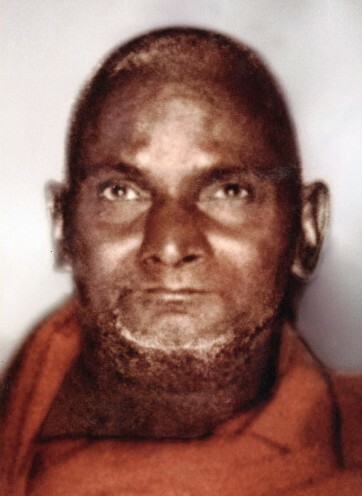 Before living the physical body, nithyananda called Muktananda and asked to wear his khadau (wooden sleeper which Indian Guru / Master wear). 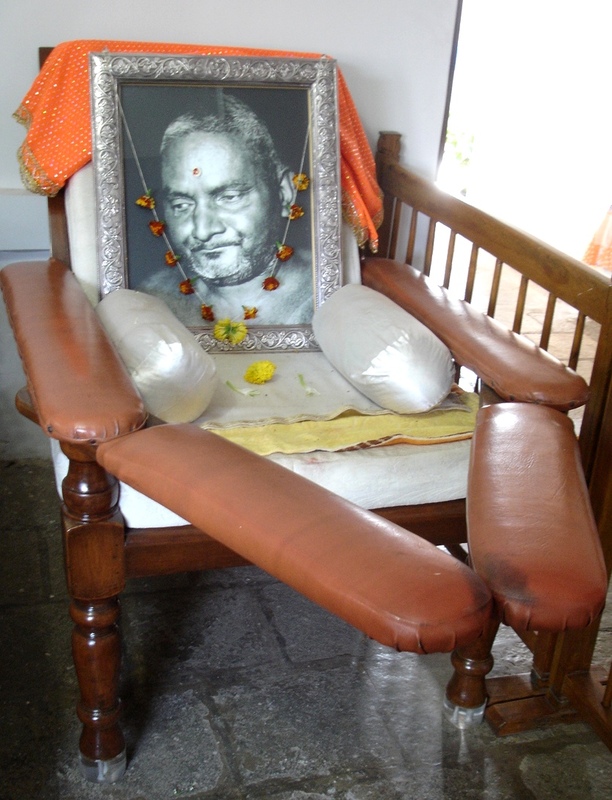 With folded hand & humble voice Muktananda said ,”Its your khadau Master, how can i dare to put my legs in?”. Nithyananda smile & he touched Muktananda’s sahasrara with Khadau. 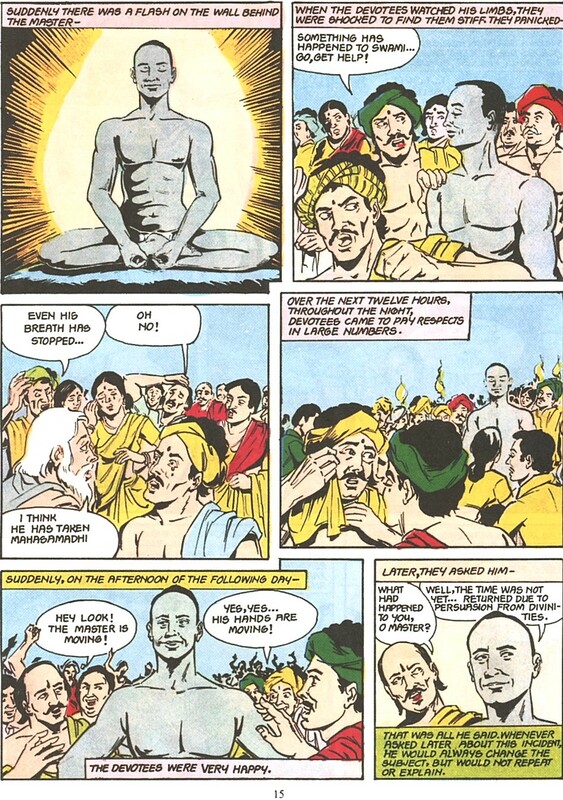 This is the moment where Muktananda got complete transformation…..As one Marathi Abhanga says, “Master makes disciple like himself immediately, Master doesnt require any time, Master makes TOUCHSTONE, instead of making gold”. HOPE ALL WELL – READ THE ABOVE MAIL REGD BADE BABA. AS I AM IN MUMBAI, I WOULD LIKE TO VISIT GANESHPURI. COULD YOU PLEASE GUIDE ME HOW TO REACH THERE. Get down on the western side of Vasai Road station, the State Transport Bus depot is just outside the station. Regular Buses for Shri Ksetra GANESHPURI are available. There are direct buses for GANESHPURI, as well as buses for Vajreshwari and Ambadi do make a stop at GANESHPURI. even Vasai SHIRDI bus makes a stop at GANESHPURI. There are also Ricksaws who can take you to GANESHPURI. DONT MISS THE 12.00 NOON AARTI. Please could you give me address or direction for contacting or visiting this ashram? I loved your writing about your visit! Thank you so much. Dear Kanchan and Shraddha, Samadhi of Baba Nithyananda is open for all every day from 4.00a.m to 9.00pm and is a little away from the Ashram. However the ashram is open for visitors 10 a.m to 11.oo am & 3.oopm to 4.oop.m only on weekends. If travelling from Mumbai, you should start at 3.30am in order to reach the ashram at 5am – Guru Gita at 5.30am is a magical experience not to be missed. May the Grace of Bade Baba lead you to his abode soon. Nithyanand bhagawan is our family guru I always be a disciple of him and I wish to mobalize to may others to be a deciple of our guru. Because nithyanand bhgawan is a living god with miracals which you will feel when you be in his faith. hi, my name is uday vaghela. i want to go ganeshpuri from bhavnagar(gujrat). will you give me information to reach there? This is near Mumbai. Any cab can take you to Ganeshpuri. From Bhavanagar, you will have to go to Thane. From Thane, you either get bus or taxi to go to Ganeshpuri. It is around 50 km and will take roughly an hour to reach. It is certaiintly a high energy place. Wish you have pleasant journey and beautiful darshan on Bade Baba. Jai Satguru – I am Jayesh V. Vaghela — From Bhavnagar come to Mumbai by Mumbai-Bhavnagar Express- get down at Borivali station — From Borivali take a local train to Vasai Road Station. You will either get a ST bus of Rickshaws to go to Ganeshpuri — do reach before 12 — 12.00 noon Aarti is very powerfull also visit the Kailash mandir and Banglorewalal building etc. Jai Nithyananda ki jai.. I like what you said, no big programs, no agendas, just be, radiate the love and everything will fall into place… Life could be so simple.. God/dess is there to help the planet and we can open to Her love to help as well, in a way where everything will fall into place. I will go to Ganeshpuri for Baba’s 50th mahasamadhi in July, 25 – 27. Aum. Thank you for sharing such a beautiful experience . Bade baba, Muktananda baba and Gurumaiji’s teachings make me alive and myself. I heard first about Swami Nityananda from my Guru who is a great devotee of the Bade Baba during my spiritual healing classes. There were many pictures of the Baba in his home and he always use to take the Baba’s name and chant a prayer to him before teaching. He told me that I should visit Ganeshpuri at least once as the knowledge he gave me is the Baba’s blessing. But one thing or the other always happened whenever I made plans to visit the place. But yesterday I finally made it there with a friend and I should say that it was such a divine experience. The whole place was vibrating with positive energy and I would feel it the moment we entered the Ganeshpuri area. I took 3 dips each at the 3 hot water springs and felt revived. I look forward to going there again as I missed the Guru Geetha and could not see all the divine places of the Baba. 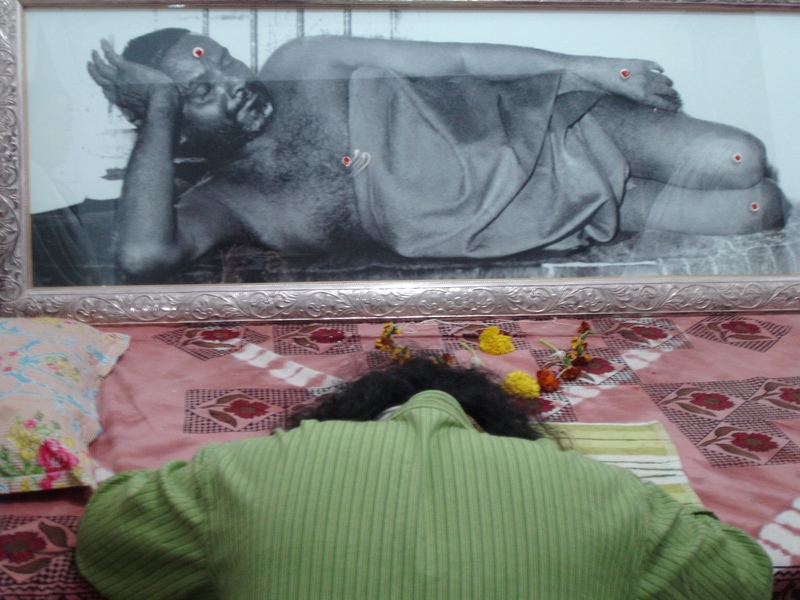 please post baba muktananda samadhi shrine photos. 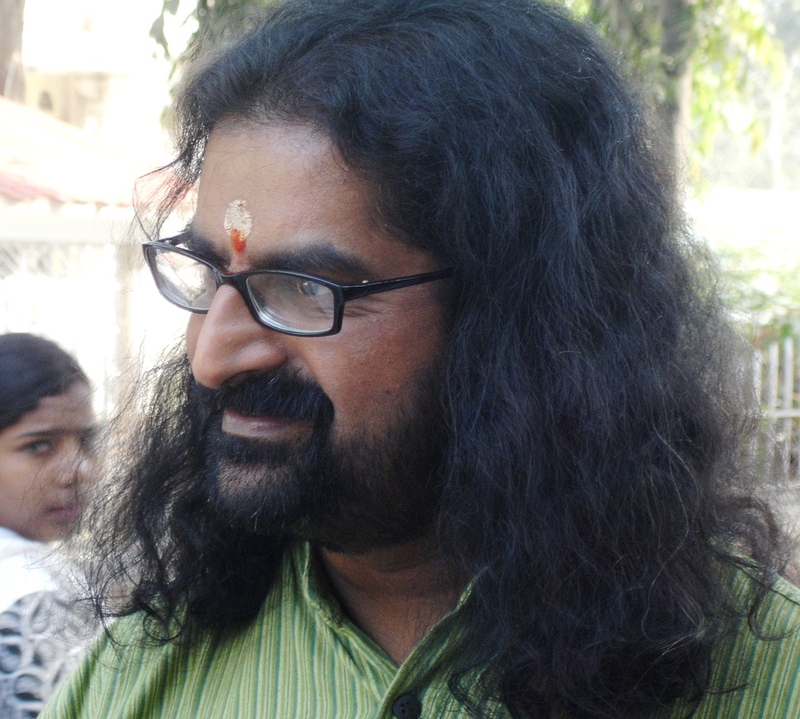 Muktanand maha….an Jai Sadguru Bhagwan. Baba hamare saath hamesha rahte hain. Mujhe jab bhi taklif me baba ne dekha hai indirectly unohone hame prasad diya hai. Jai ho baba ki. Baba hamare saath hamesha rahte hain. Mujhe jab bhi taklif me dekha hai indirectly unohone hame prasad diya hai. Bolo Om Namo Bhagawate Nityanandaya. Why is money required to do a Paada pooja by any desciple? If one has so many powers to do anything that he likes, why is there a requirement of money to do the pooja.